We have all seen the tavern sign that proudly displays a large mug of brew overflowing with a foamy head. Then there is the dental office that displays a large sign in the shape of a tooth (roots and all) with the inscription “Flossy Pain & Owen I. Hurt, DDS”. In days gone by every shop would hang such creative shingles over the front door. By the time the 1920’s came along a new twist was added. Witness the Milk Can/Bottle building which used to house an ice cream bar (Route 146, Manville, RI). Entire buildings became advertisements. It even spread to cars shaped like hot dogs (Oscar Mayer Weiner). 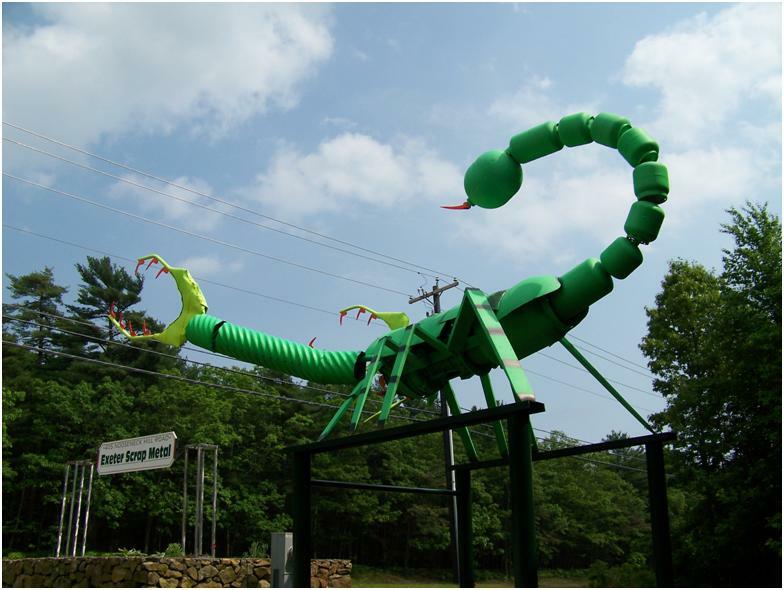 In Rhode Island New England Pest Control placed an enormous bug on a roof along route 95. It became so popular that it eventually changed the company name to “Big Blue Bug Solutions”. All of these signs have one thing in common: they are a special and endearing form of folk art that serves to inform and mostly make people happy. They are also often original works for which there are not duplicates. What happens when a rural scrap metal yard decides that they have to advertise their presence with something better than a 4×3 placard? Do they place an old automobile on their roof? I’ve seen that one quite a few times. What about something constructed from their stock in trade, junk metal? Witness the Exeter Scrap Metal scorpion. This gigantic scorpion just suddenly appeared along route 3 in Exeter, RI. The scenery on this road consists mostly of forests, fields, and businesses that have the word ‘tavern’ in their name. There are also two competing scrap metal yards on either side of this highway that is situated in a particularly desolate section of Exeter. They have always had rather small signs of no special distinction. Lately they have been doing increased business due to the economic slump that has once again made steel and aluminum attractive commodities (robberies are up too; I can personally attest to that). The Exeter Scrap Metal scorpion appears to be constructed of some very interesting parts. I can’t identify very many of them, though. 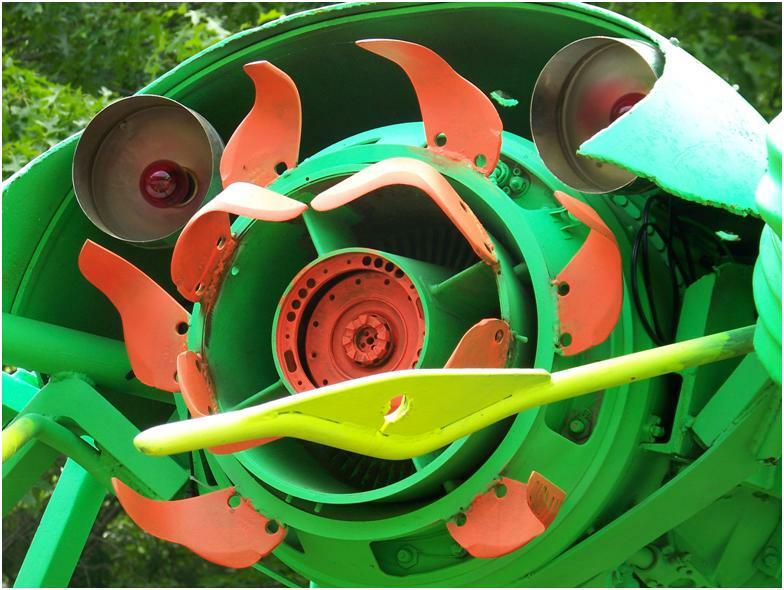 This head appears to be made from a scrap jet engine to my untrained eyes …. or is it part of a well drilling rig? Your guess is probably way better than mine. It sure is neat to look at! If you ever find yourself on route 3 in Rhode Island along the Exeter / Richmond town lines, stop by and check out the scorpion. You’ll be glad you did. 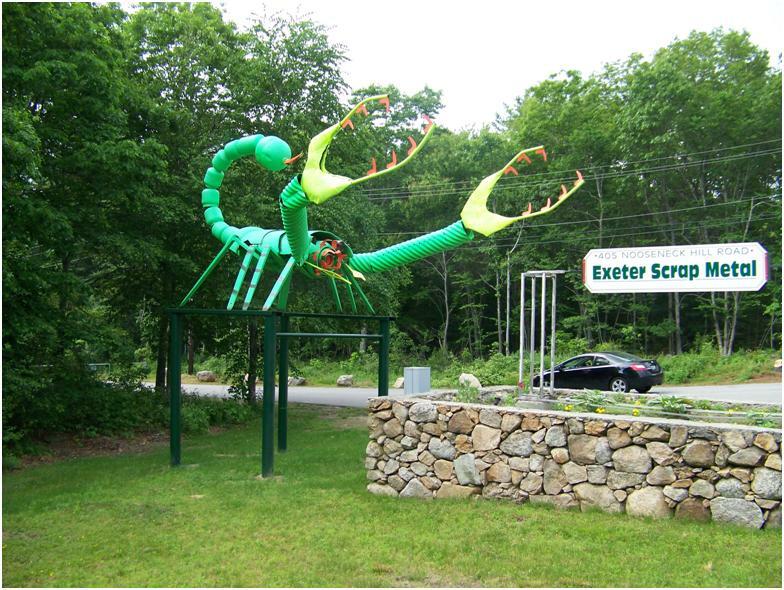 This entry was posted in Occasional Commentary and tagged art, County, Exeter, Island, metal, Rhode, RI, roadside, scorpion, scrap, sign, South. Bookmark the permalink.